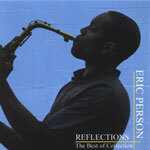 Reflections is an enjoyable selection of saxophonist Eric Person's music from 1993 to 2003, culled from five CDs, plus three previously unreleased tracks recorded at the 1998 Texaco Jazz Festival. All the pieces showcase Person's impeccable chops, which combined with his warmth, intelligence, and wry humor, make him a very special talent indeed. There's not a false note on the whole collection, but several songs in particular stand out. "Perfection" has an angular melody and unique conception; Person's sax perfectly captures the human plight of reaching for the unattainable, and John Esposito's lyrical piano provides the ideal complement to Person's strength and fluidity. "Mr. More or Less" has an unabashedly pretty melody, but with an undeniable tinge of irony. Person shapes his notes beautifully, and he's totally simpatico with flutist Jim Finn's light, lovely runs. Bassist Dave Holland appears on this track as well, giving the tune further backbone. "Reach!" is a marvelous, spirit-lifting song with warm, cheerful energy, and "Ancient Sun" is flat-out beautiful, a gentle, evocative ballad with spacious electric guitar sounds by Cary Denigris. 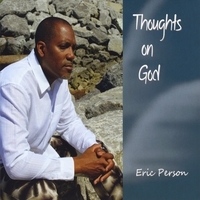 Ten of these twelve tracks are Person originals, and he proves himself to be a gifted, original composer. The musicians are uniformly excellent, including trumpeter Dave Douglas on the Texaco Jazz Festival cuts. Person has been on the jazz scene for over twenty years now, leading his own groups and playing with heavies like McCoy Tyner, Donald Byrd, and Chico Hamilton. He's integrated all of his experience and hard work into a distinctive voice, and Reflections is an excellent summation of this versatile, expressive musician's workthus far. Track Listing: Perfection; Mr.More or Less; Friends Again; When Morning Comes; Implications; Extra Pressure; Reach! ; Ancient Sun; K.T. ; The Ringleader; Etc. ; Next Love. 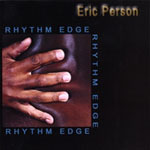 Personnel: Eric Person: alto & soprano saxophone; Cary Denigris: electric guitar; Jim Finn: flute; Mike Cain: piano and synthesizer; John Esposito: piano; Dave Douglas: trumpet; Kenny Davis: bass, electric bass; Dave Holland, Carlos Henderson, Calvin Jones: bass; Gene Jackson, E.J. Strickland, Peter O'Brien, Ronnie Burrage, Mark Johnson: drums.